This review was first posted on Music, Books and TeaI'm slightly unsure over how is best for me to write this review. This book was not what I expected it to be, and I'm still trying to work out whether or not that was a good thing. It had many of the qualities of a great book, yet something fell a little short for me, although I'm not entirely sure what that something was.I thought the concept of Struck was great: a girl who is addicted to lightening strikes that has to choose between two opposing groups and either save the world, or destroy it. There were times in the book that I connected with Mia, I really felt that Mia was a family-driven person, who only wanted her brother and mother to be safe, and if that meant spending money that was fast running out on medication to help her slightly displaced mother, then so be it. I got why she hid her scars around people too - she already felt like a freak, especially after an incident in Arizona where she almost killed a girl, and didn't want the kids at school seeing the red scars that being struck by lightning caused. Her insecurity reflected that of a typical female, there's not many females on this planet that are one hundred percent comfortable with everything about their bodies, and I enjoyed the fact that Jennifer Bosworth acknowledged that in a clever way.The romance with Jeremy was something I didn't fully buy into. Mainly because at the beginning of the book, he tries to kill her. No joke. And then she falls for him. It's not quite insta-love, but it's close, and I can't really imagine someone like Mia, who seemed like she was going to be a strong female character at the beginning of the book, to fall for him just like that. However, as a character, I found him extremely interesting, especially when all was revealed with him. He definitely gave a new meaning to 'dark and mysterious' for me! I didn't fully understand his connection to Mia, although I suspect, if a sequel is to be written, that it will hopefully be explored more in a second book. The romance didn't detract from the story, however, and Jeremy remained central to the plot regardless.The book takes place over the course of four days, leading up to the biggest storm Mia will have ever come across yet. This means that the book itself was incredibly intense, as so much was packed into such a short time, although some points did come off a little rushed. It's hard to explain what these were without giving anything away, so I think it's best that I just keep quiet on that and not ruin Struck for people. ;D The two opposing groups were something I found really interesting, and I'd love to see what will happen with them now that the storm is over. The religious aspect of this book is pretty prominent, but it's not offensive. Of course, that may put some people off reading it, but it shows two extremes of 'religion', although it's not the typical religious aspects we're used to seeing in fiction. 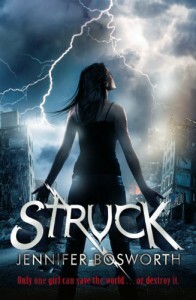 The opposing groups' battled it out to the very end of the book, and I wasn't sure who was going to come out on top, but I was pleased with the ending.Overall, Struck was an exciting debut, and whilst there were some things I wasn't totally satisfied with, I am eager to see what Jennifer Bosworth produces next!